I’ve been thinking about getting into medium format for a long time. I’ve owned 35mm Canon cameras for about twenty years, and a Calumet Cadetfor almost two, and I’m pleased with the results I get from both. The grain-free enlargements from 4×5 originals are great, and the convenience of autofocus 35mm cameras is really nice, but I kept longing for larger negatives than 35mm without the hassle of 4×5. Enter medium format. After a few days of researching the subject, I found a few alternatives to$20,000 Rolleis and decided to try Calumet’s $120 offering: the Seagul WWSC 120 TLR. There’s a rotating knob on the bottom of the camera, the exercise is to rotate it to the “O”pen position, and then opening the body. Load the film on the bottom, thread it, insert the leader in the take-up spool, remove the slack and advance it with the wind-up crank until the arrows on the paper backing align with the markings on the body. Close the camera. No surprises here. The viewscreen is fairly bright, and there’s a built-in focusing loupe you can pop-up and help you focus. There’s also a split-prism focusing aid in the center of the screen. Using a waist-level finder was a new experience for me. I got used to it fairly quickly, though I did have some surprise elements creep into the slide that I did not see while composing the shot. This is because of parallax: the viewing lens is slightly higher than the taking lens. With practice, however, you can learn to correct for this limitation. You can use an eye-level finder after focusing, basically, you put down the front side of the hood, and look through a square opening on the rear side of the hood. The focusing knob is well dampened, and it has the very useful DOF markings. The shutter goes from 1 second to 1/350, plus B, and since it’s a leaf shutter, sync is achieved at all speeds. There’s a self-timer, and you can screw-in a standard cable release. Neat feature: multiple exposures of the same frame are possible. The camera does not have a built-in light meter. I’ve been using my Minolta Spotmeter F, and I shot a few frames following the Sunny/16 rule. There’s a hot shoe on the side, above the focusing knob, and a PC connector on the front. Once you shot the last frame (you get twelve), you just keep on turning the crank until you hear the rollfilm leave the original spool. Crank a few more times, to be on the safe side, and open the camera. Moisten the paper leader, attach it to the roll, and pull the roll off the camera. Then take it or send it to one of the labsrecommended elsewhere in this website, or your favorite pro-lab. I hope some day to have some sample scans online, meanwhile, you’ll have to take my word for it: the lens suffers from severe vignetting from f3.5 to f5.6, and moderate from f8.0 on. It’s tolerable, particularly with print film, past f16. However, I found the lens to be sharpest at f11, so if you like shooting slide film, you’ll have problems if your subject matter includes a lot of uniformly lit surfaces near the edges (say, the sky on a landscape). 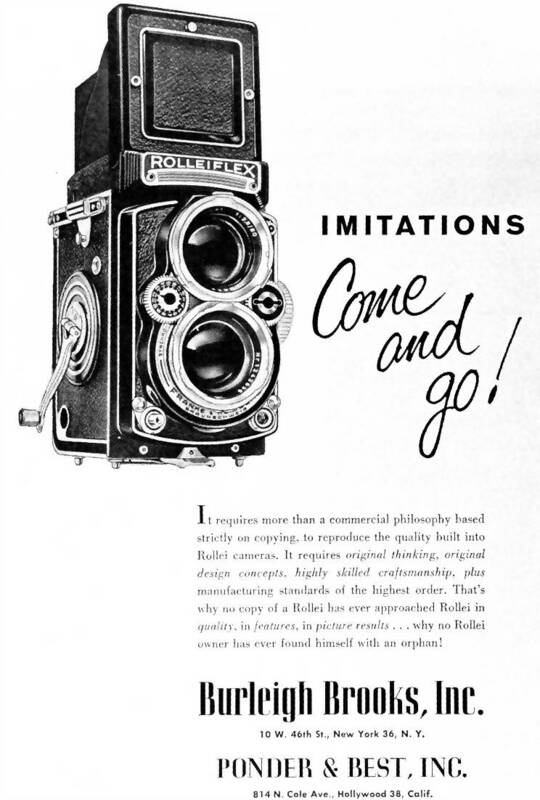 The camera only accepts 120 format film, contrary to what’s stated in the 1998 “Essentials” catalog from Calumet, which says it’ll take both 120 and 220. The number of available emulsions is higher in 120 format, but some people like having 24 exposures per roll. If you’re looking for a new camera to get started in medium format, the Seagull WWSC is a great value, at around $100 or so. I’m not aware of cheaper MF cameras (I know about Holgas, but my definition of “camera” includes the term “light-tight box”…). via Seagull 120 TLR – photo.net.